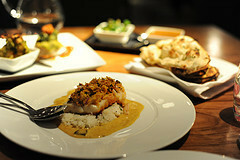 executive chef Vivek Singh consider making it an a la carte regular. Should the occasion arise to celebrate or you're simply looking for a good excuse to indulge in a quality meal this month, keep this modern and stylish Indian restaurant's “Coastal” menu in mind. Cinnamon Kitchen is located at 9 Devonshire Square. Visit www.cinnamon-kitchen.com for more info.